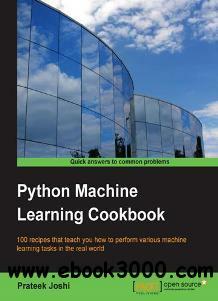 100 recipes that teach you how to perform various machine learning tasks in the real world. Machine learning is becoming increasingly pervasive in the modern data-driven world. It is used extensively across many fields such as search engines, robotics, self-driving cars, and more. With this book, you will learn how to perform various machine learning tasks in different environments. We'll start by exploring a range of real-life scenarios where machine learning can be used, and look at various building blocks. Throughout the book, you'll use a wide variety of machine learning algorithms to solve real-world problems and use Python to implement these algorithms. You'll discover how to deal with various types of data and explore the differences between machine learning paradigms such as supervised and unsupervised learning. We also cover a range of regression techniques, classification algorithms, predictive modeling, data visualization techniques, recommendation engines, and more with the help of real-world examples.